There was a time when Lebanon’s capital city was a prime tourist destination, renowned for its night life. Then the PLO moved in and the party came to a screeching halt. Up-and-coming Foreign Service Officer Mason Skiles was stationed there when things first started to go bad. Reluctantly, he agrees to return ten hard years later in Brad Anderson’s Lebanon, which screens during this year’s Sundance Film Festival. In 1972, Skiles’ star was on the rise. Lebanon was getting more violent, but it was not the wasteland ruled by the Hezbollah terrorist group that it is now. Skiles and his wife were in the process of adopting a war orphan named Karim, but unbeknownst to the Yanks, the scruffy thirteen-year-old is actually the younger brother of notorious Munich terrorist Abu Rajal. That is why the Mossad crashes the Skiles’ soiree hoping to grab Karim, but his brother’s faction gets him first. Flashforward ten years. Skiles is now a boozy labor mediator, who wants nothing to do with the Middle East. However, he gets pulled back in when all-grown-up-terrorist Karim abducts Skiles’ old pal, Cal Riley, the local CIA hand. Karim demands the release of his brother in exchange for Riley and he insists on Skiles as the negotiator. Rather inconveniently, the CIA is not holding Rajal and they are far from sure the Israelis are, either. Tony Gilroy’s screenplay is very le Carré-esque, in that it posits mixed motives and duplicity on all sides. At least in this case, that includes the PLO, who might be the scummiest of all, which indeed they are. Regardless, there is plenty of enjoyable intrigue and a fair degree of action. Using Morocco and CGI, Anderson also gives us plenty of opportunities to gawk at the wreckage of the city, Holidays in Hell-style. As Skiles, Jon Hamm makes a perfect boozy anti-hero in the Graham Greene tradition. He has the right look, size, and presence to be a disillusioned policy wonk who can mix it up with terrorists. Frustratingly, Rosamund Pike is largely squandered as Riley’s trustworthy protégé, but Mark Pellegrino exhibits his usual flintiness as the hardnosed Riley. 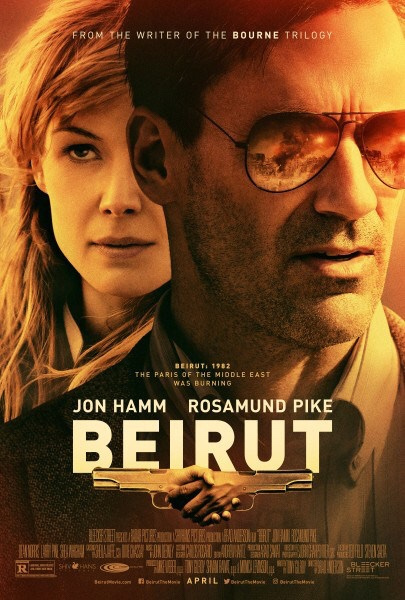 Beirut is a cynical film, but what can we expect, given the backdrop? If anything, the prognosis for the Hezbollah-dominated nation is even worse now, than during the civil war-torn 1980s. Anderson maintains a healthy pace and juggles the large cast of characters adroitly enough. Recommended for fans of murky international thrillers, Beirut screens again tomorrow (1/27) in Park City, as part of the 2018 Sundance Film Festival.